Fit-Ink: I Want America's Best Summer Job in Vail! It might be one of the most overused phrases about Vail: "You come for the winters but stay for the summers." I've heard it, I've had it repeated to me at media events, I've read it, I've even experienced a weekend of it at last summer's GoPro Mountain Games. But what's so appealing about a place that was built specifically for skiing during the one season that's not for skiing? There must be something special about that mountain flora and fauna that makes those snow seekers stay. And Vail wants one person to find out this summer and share those experiences--and get paid for it--in 10 weeks at America's Best Summer Job. The job application had me sold at first read. Adventure-minded mountain enthusiast. Biking. Hiking. Dining in great restaurants. Participate in events. Not only did these characteristics describe me (hello, I'm the girl who plays outdoors all day so she can eat at those restaurants--and not weigh 200 pounds), but selfishly, I wanted to win. Maybe I can improve my mountain biking skills? The only problem would be making a video to sell myself, which is my sister's forte (the film major), not mine. Well, that and selling myself to a bunch of strangers in what could be viewed as a popularity contest when it comes to the vote-getting--and never winning contests even when they're a complete luck of the draw. But sometimes when you want something so much, you'll do whatever you can to at least give yourself a chance. Even if it means memorizing lines, having great ideas while you're skiing but can't get them to sound right later, and barely giving yourself 48 hours to gather votes. I didn't go for it a few years ago when I never made a video to submit to the Ultimate Mountain Gig at Utah's Canyons Resort, a similar contest but for winter. Lesson learned. It took a weekend off from skiing to finally get it done, but alas, I did make a video to illustrate why I should be selected. You can view it on Vail's blog where you can also check out other submissions or upload your own. So here's where I need your help: I need your votes on that video, which you can view and vote on here (once per device per day until April 7). Shameless self promotion, I know, but every vote gets me one step closer to 10 weeks of breathing mountain air in a place I know well in the winter but feel like I hardly know in the summer. And who better than a Vail visitor to discover a share all those summer experiences? Maybe I'll fall in love with that Vail summer and want to stay, too. Click this link to cast your vote, and thanks for your support! 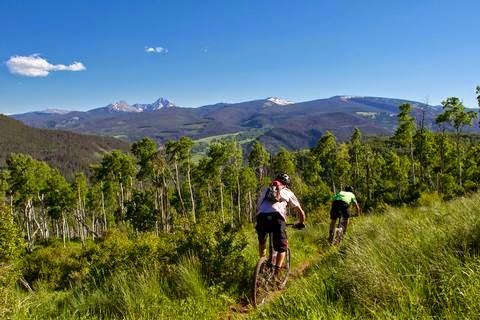 Photo (mountain biking) courtesy of Vail Summer Newsroom.